Prominent & Leading Manufacturer from Thane, we offer pneumatic knife gate valve, knife gate valve for cement hopper, o port knife gate valves, bi-directional knife edge gate valves, knife gate valve - fabricated and knife edge gate valves. Knife gates powered by air cylinders, also made inhouse in our factory, gives a robust and long lasting solution for your automated valves requirements. Available in Fail safe - spring return or Fail safe- double acting with reservoir tank, FLUIDTECQ offers the complete range of pneumatic knife gate valves. 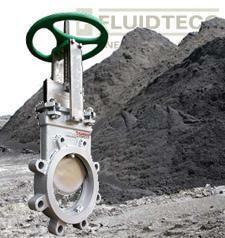 Pneumatic Actuation of Knife Gate Valves are guaranteed for smooth operation. • Double Acting / Spring Return Single Acting Cylinder. • Position Indication - limit switches or reed switches. 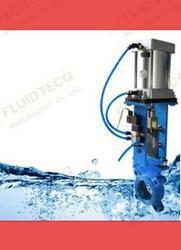 • Solenoid valves - FLUIDTECQ make poppet type 5/2 way or 3/2 way. • Bellows or Gaitors to protect cylinder rod from dust/dirt particles. 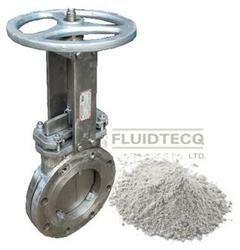 • Sand Blasted Knife gate valve with epoxy painting for better resilience. A very common application is at outlet of cement hoppers (dry powder). Uni directional knife gate valve.Metal to Metal seat. (Replaceable / Integral Metal seated)Valve with a cone deflector. This further enhances protection to the valve seat and increase longevity especially if the usage is high. The O Port valve, also called through-port valve has its basic advantage in the fact that the knife plate never leaves the hole, thus leaving no room for powder deposition. The moving plate has a hole in the middle which coincides with the port to give a full flow when open and offers a 100% shut off when closed. Sizes from 80NB to 600NB as standard; Other sizes can also be made on request. The valves are primarirly used for handling solids in flow media. Best Suitable for Powders, without worrying about accumulation. The valve has a class VI shut-off. No Lubrication or Maintenance is required. The valve can be used as shut-off valve, flow control valve and end of line. Even in a partially open position the valve has a straight flow direction, unlike other valves. Compact design, Short face to face dimension. Foreign matter does not get jammed between the gate and the body. This prevents seat damage so that the valve always seats well. Bi-Directional Knife Edge Gate Valves offered are manufactured as per the MSS-SP-81 Standards and are quality tested so as to match up with the end application demands of the customers. We can make these available in different finish size options including from 3" to 22" with possibility of offering other sizes also as demanded by the customers. Featuring use of round, square as well as rectangular finish shapes, these valves feature superior metal to metal seating as well as suitability for high temperature applications. Size 2" - 24" Higher sizes can be made. Contact our sales office. Gate - SS304, Ni-Cr Plated hard plating for high abrasion resistance. Packaging Details: Best Quality Wooden packing to avoid transport damage. The Fabricated Knife Gate Valve designed and manufactured by FLUIDTECQ are for special applications such as Pharma, Gasifiers, Process Industries, Chemical Industries for powder, granule, pastes, paints application. These valves are fabricated from Sheet metals, flanges, plates to give you the best finishing without compromising the quality that we offer with our standard Knife gates. All valves are tested 100% for Clean operation and sealing before they leave factory. Knife Gate Valve shown here is of SS316 Body. We offer a huge range of Knife Edge Gate Valves used in varied industrial applications like Paper & Pulp Industries, Mining, Coal Handling, Water treatment plants, pneumatic conveying plants, Cement Industry, Chemical Plants, Sewage Treatment plants, etc. •Body: CI, CS, CF8, CF8M, Hast ‘C’ Solid 1 Pc casting. •Outer Chest: CI, SS lined internals. •Further automation with Positioner can be given to operate the valve on to signal of 4-20 m-Amps. 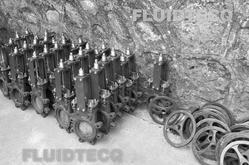 Complete valve and actuator packages tailored to fulfill your system requirements are available from Fluidtecq, thus giving a single source of responsibility for proper valve/actuator operation. Generally available in Cast Iron and Stainless steel gate plate, these valves offer optimum isolation and are thus used in Pulp and Paper industries, Sugar industries for handling Molasses, Cement Industries, etc. Available in wide range of sizes, and Manual Handwheel operation. Looking for Knife Edge Gate Valve ?